Didn't find a category that matches your business? No worries. Chat with our sales specialists to see if talech is a fit for your needs. Run your business better with an all-in-one business solution. talech and HP are designed to help you run your businesses better. Get up to the minute views of your cash flow and real-time reporting into your business to make better decisions. Create and customize your menu, take orders, split checks, track inventory and manage employees and customers with just a few simple taps. From the global leader in computing devices, the HP Engage One Prime is a modern, sleek hardware platform that is designed from the ground up for the needs of small business. With instant underwriting, flat rate pricing and next day funding, PayPal is the all-in-one payment solution to help grow your business. With EMV, Apple Pay®, and end-to-end encryption, your customer data is protected by the latest authentication technology. Customers can pay by chip, swipe, tap, and even contactless payments like Apple Pay® and Google Pay at the point of sale or on the go. Stay connected and manage your business from the office, at home, or even on the road. All your data is available to you in real-time. Stay connected with talech and manage your business from the office, at home, or even on the road. All your data is available to you in real-time. Never miss a beat with our industry leading 24/7 support. A real person is always available to answer your questions at no additional cost. Never miss a beat with talech's industry leading 24/7 support. A real person is always available to answer your questions at no additional cost. *Fees subject to change. 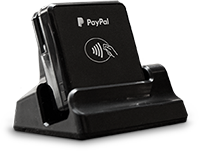 To learn more about fees, please visit PayPal's fees page.